Like you, every K-Laser story is unique. Explore real-world examples of how therapeutic laser is changing lives. See the dramatic results for yourself. It may be the first step in finding the help you need to treat your pain. Laser Therapy is the use of specific wavelengths of light (red and near-infrared) to stimulate the body’s natural ability to heal. The effects of laser energy include improved healing time, pain reduction, increased blood circulation and decreased swelling. 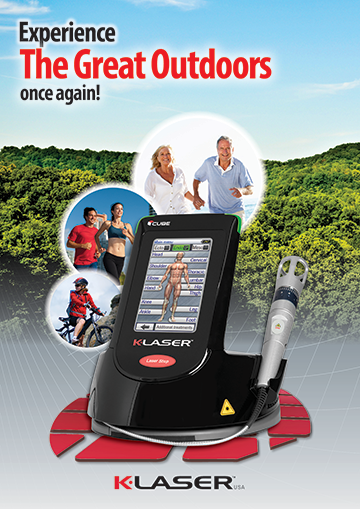 What Makes The K Laser Special? Most Lasers have low power whereas the K laser has potential power output of up to 40X greater depending on the condition being treated. What are the benefits? What should I expect during a typical K-Laser treatment? What are the effects of class IV laser therapy on cell function and health? Find the answers to these and other common questions you have about the use of therapeutic lasers.